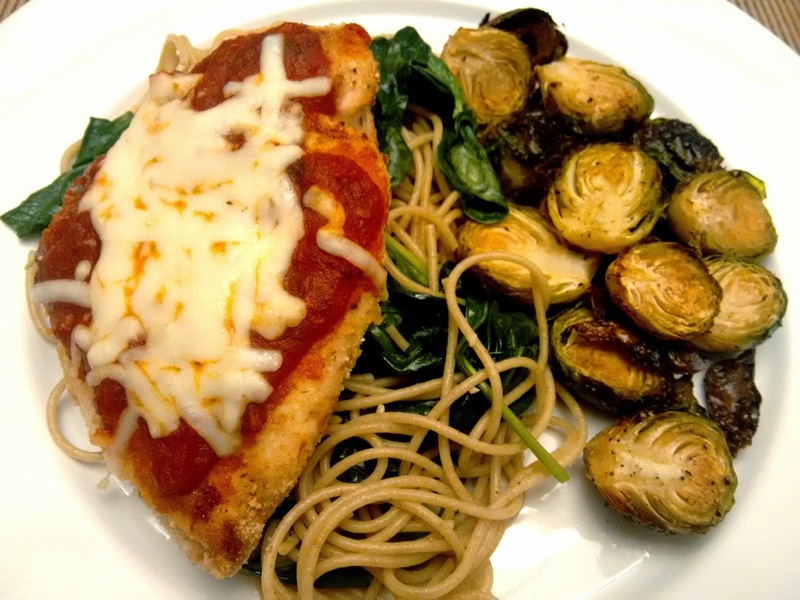 Chicken Parmesan was my favourite dinner when I was a kid. I wanted to make a healthier version to serve alongside my favourite veggie--garlic roasted Brussels sprouts! I cut back on the breading by brushing the chicken breasts with olive oil rather than dredging with flour and egg, and baked them instead of frying. Preheat oven to 400°F. Line a baking sheet with tin foil and spray with canola. Pour olive oil into a small bowl. Pour breadcrumbs into a separate bowl. Brush each chicken breast with olive oil, then dunk in breadcrumbs to coat. Place chicken evenly spaced on baking sheet. Bake for 20 minutes, then remove from oven and flip chicken breasts over. Put chicken back in oven for 5 more minutes. Remove from oven, then top each chicken breast with 2 tbsp each of marinara sauce and mozzarella. Return pan to oven and bake for another 5 to 7 minutes, until chicken is fully cooked.